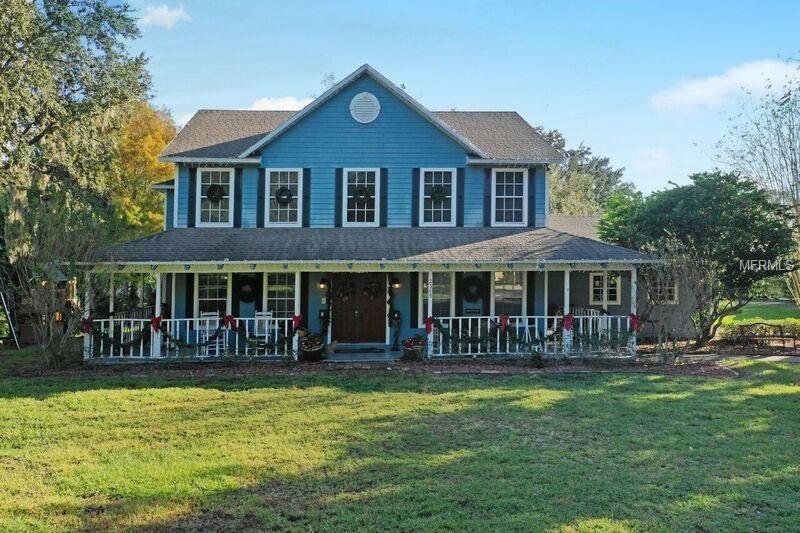 "CHECK OUT 3-D TOUR"AMAZING CUSTOM BUILT Farm House style home is set back off the roadway on nearly 3/4 of an acre. Majestic oak trees with a perfectly manicured lawn. Sit on the the front porch which wraps the entire front of the home! As you enter the home you are greeted by the spacious living room that has access to either wing of the house. The large dining area is connected to the farmhouse island kitchen boasting detailed cabinetry and a gorgeous built in nook offering unique seating, for meals and gatherings. Wood stair case featuring wrap-around railings leads you to the upstairs. The huge master bedroom includes a sitting area and large walk in closet. The master bath is open, with his and her sinks, stand up shower and roman tub. Each of the upstairs bedrooms offer plenty of space and California closets. NEW AC 2018, HARDY BOARD SIDING WITH LIFETIME WARRANTY Centrally located with easy access to Disney, The Loop, Orlando International Airport and beaches! Available to close before the Christmas Holidays!